If you have been around here much at all, you know Katrina and I love our oils. We are somewhat religious about our oil usage, and take them everywhere with us. 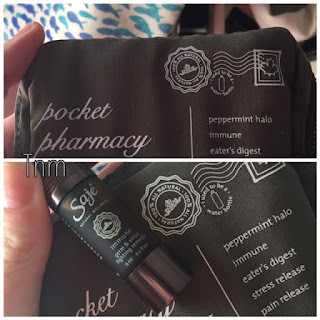 So when I heard about Saje Natural Wellness pocket farmacy, I know I had to give it a try, and toko it with my on vacation to NJ this year. 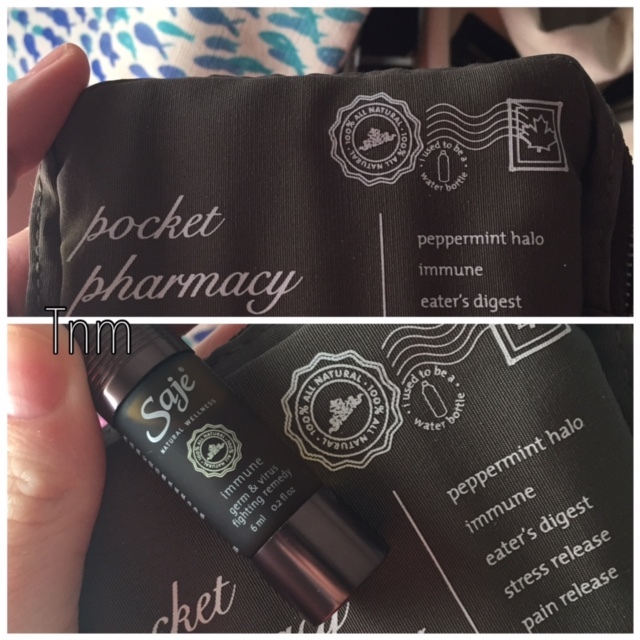 "A must-have natural farmacy for every day, including five of our best selling therapeutic remedy roll-ons - Peppermint Halo, Stress Release, Pain Release, Immune, and Eater's Digest." Within minutes of arriving on vacation we were using the immune remedy. Even though this is for symptoms of a cold, I know it has some great germ fighting oils in it, so when my son fell and scrapped his knee, I put a drop of this on the band-aid before I applied it to knee to keep him from getting an infection. We also The applied a little of this to the bottom of our feet before boarding the plane to combat some of that dreaded recycled air. The peppermint halo helps me in so many ways. If I am feeling a little sick to my stomach, the smell of this helps...if I am hungry while trying to watch what I eat, the smell of this decreases my appetite, but my favorite way to use it is applying it to my temples when a headache is coming on! Its so effective at getting rid of my headache. The eater's digest is perfect on vacation when the littles eat too much junk, and it is just what doctor mommy ordered to rub on their bloated bellies. Of course, being around family causes stress, not to mention our own three children, so the stress release was a must and made me feel calm and more relaxed as my son was kicking the chair in front of him! Sorry guy sitting there, but mommy was relaxing! My hubby used a lot of the pain release because he has a Achilles Tendon injury and we did a lot of walking. This helped him so much!! I also love this neat little case that they come in. Its a cloth case, and made of a pretty heavy duty nice material. It's pretty stylish too! The oils that come in the kit are a large size, so I know they will last me for a long time to come, and come in darker bottles so they are safe and protected from light. Saje Natural Wellness is definitely a new shop of mine, and I will be doing some of my Christmas shopping there this year!